Generally, my work is a personal narrative about place. 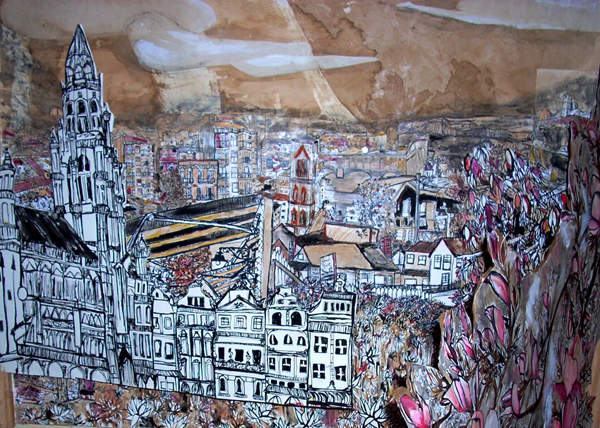 My work begins in the form of hundreds of drawings and watercolors, observed from life…The drawings are then used as the raw materials to create collages—some of them huge and complex, others small and delicate…Real places become the building blocks for the creation of imaginary landscapes. I have then pushed this process one step further by developing ways to interact with these collages. One way I have done this is by allowing people to manipulate the collage through the use of moving overhangs, magnetic pieces that can be added or removed to change the picture, and expandable pages. I have also begun working in video with the use of stop motion animation. …Collage is a process that is about bringing together disparate parts and making them work harmoniously as a whole, making them more than the sum of their parts. With this project I would hope to bring together my experience as an artist, as a traveler, as an Italian-Polish American, with new experiences in Calabria to create a new series of work.